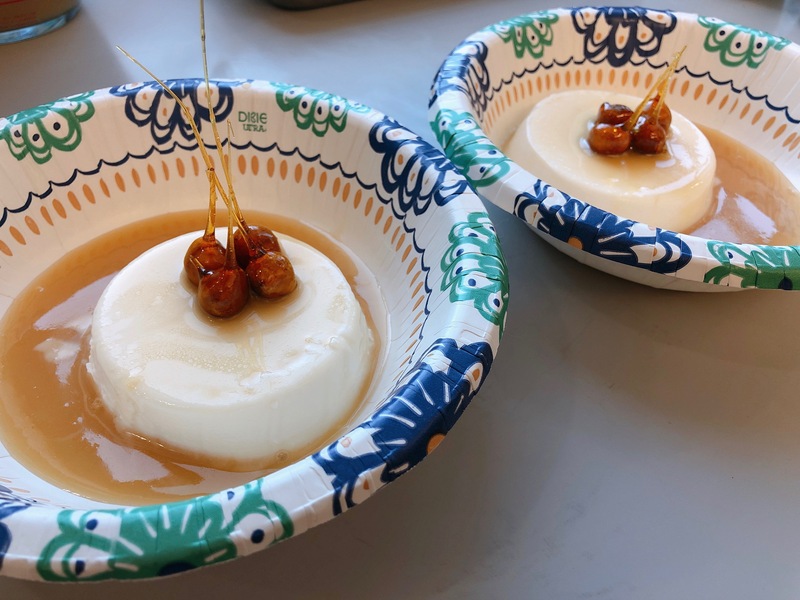 This sweet Italian dessert consists of panna cotta, a creamy liquid that then forms a soft gelatin, which is then covered with caramelized sauce and decorated with candied hazelnuts. 1. Spray a paper towel with some cooking spray and wipe the insides of the ramekins. 2. Pour the milk into the saucepan and sprinkle the gelatin evenly over top. Let this soften for 5 minutes or until the surface is wrinkled and the gelatin grains look wet and slightly dissolved. 3. Set the saucepan on low heat and warm the milk gently, stirring frequently so that the gelatin dissolves. 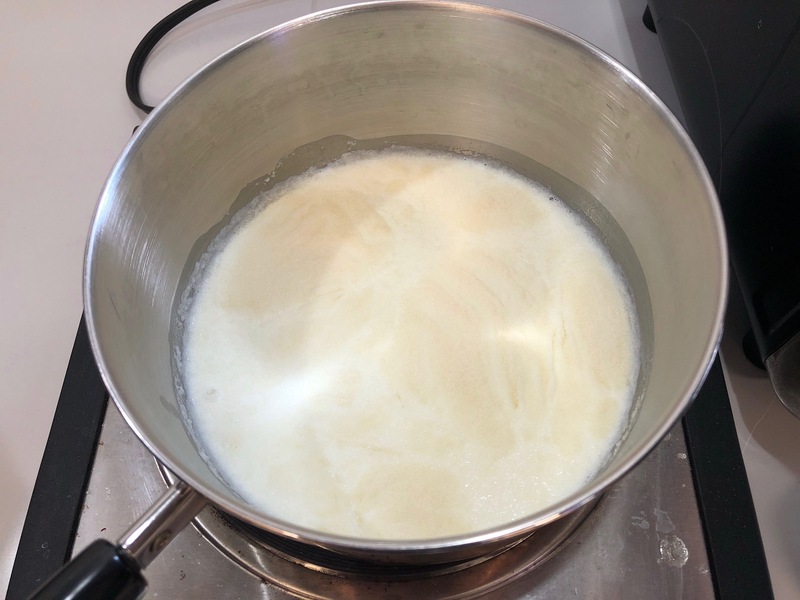 Never let the milk boil or simmer and if there is steam remove it from the hear and let it cool. This part should not take long. 4. 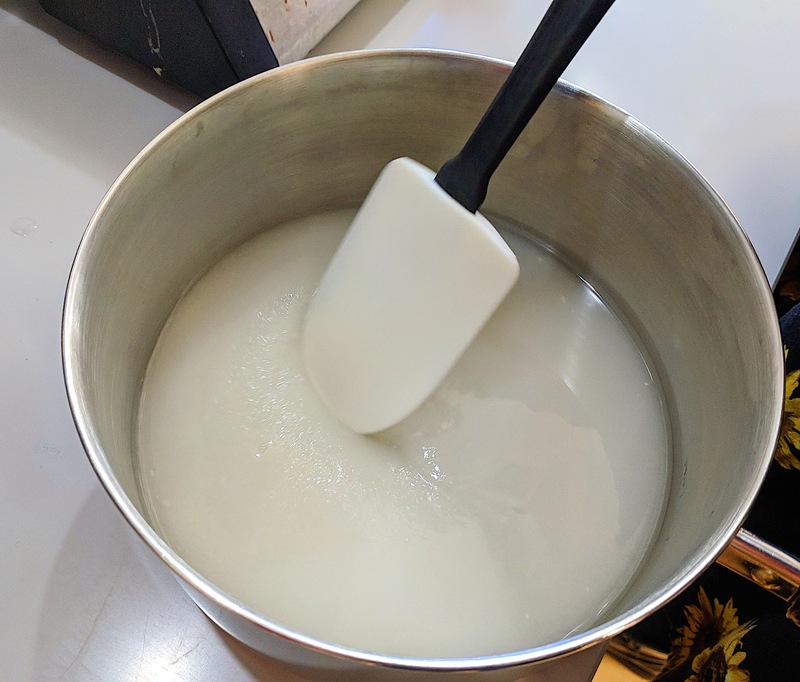 After 2 minutes of warming, rub a bit of the milk between your fingers to make sure it’s smooth, or dip a spoon in the milk and check the back for distinct grains of gelatin to make sure the gelatin has dissolved. 5. Next stir the sugar into the milk and continue warming until it dissolves too. This should take about 5 minutes and never reach a boiling level. 6. Once the sugar is dissolved remove the saucepan from the heat and whisk in the cream, vanilla, and salt. 7. 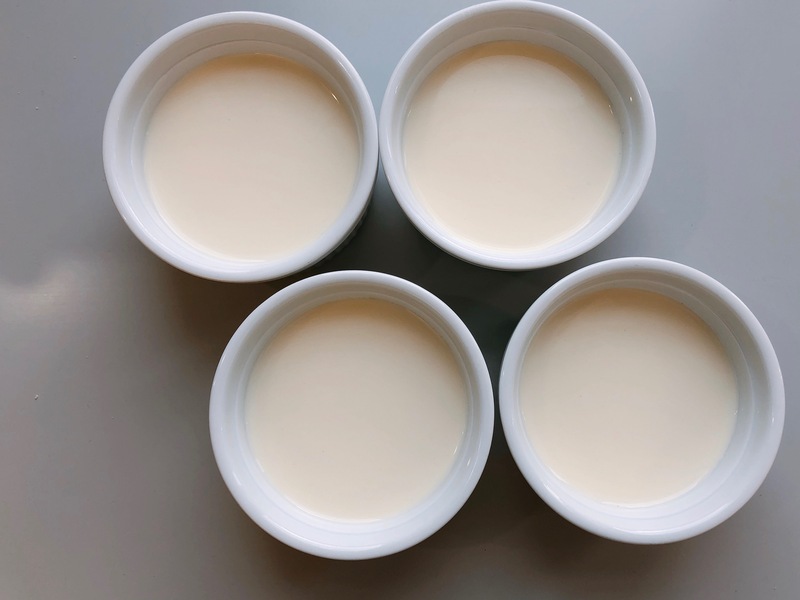 Finally pour the panna cotta into the oiled ramekins and refrigerate overnight. 1. Have a bowl of cold water nearby in case you get the hot sugar on your skin. 2. On medium heat, warm the cream and butter in the saucepan until the butter melts. Then take it off of the heat and pour the mixture into a measuring cup. 4. Over medium-high heat you will cook the sugar syrup without stirring and you will let it come to a boil. 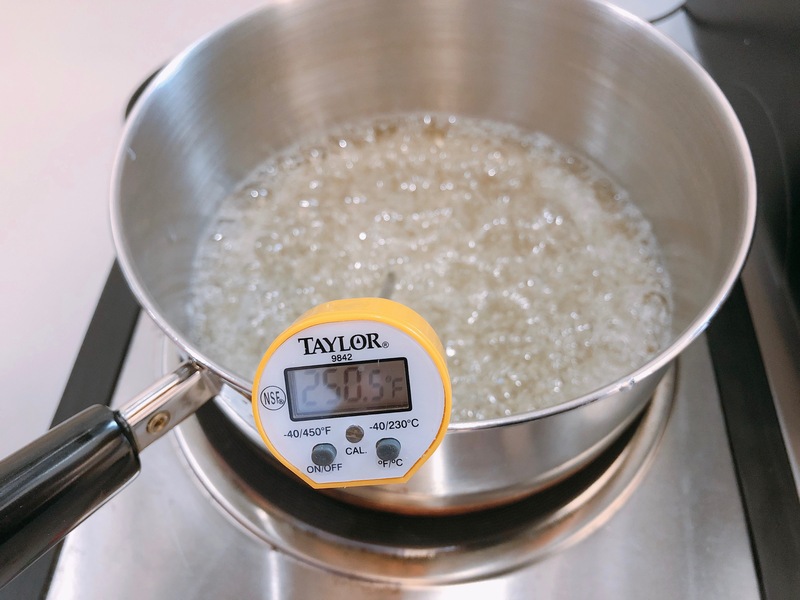 Around 250°F, the sugar syrup will turn transparent and boil rapidly. Around 320°F, the mixture will start to caramelize and it is at this point you can decide how dark or light you want your syrup to be. Once it is at your desired color take it off of the heat but do not let it go past 350 degrees. 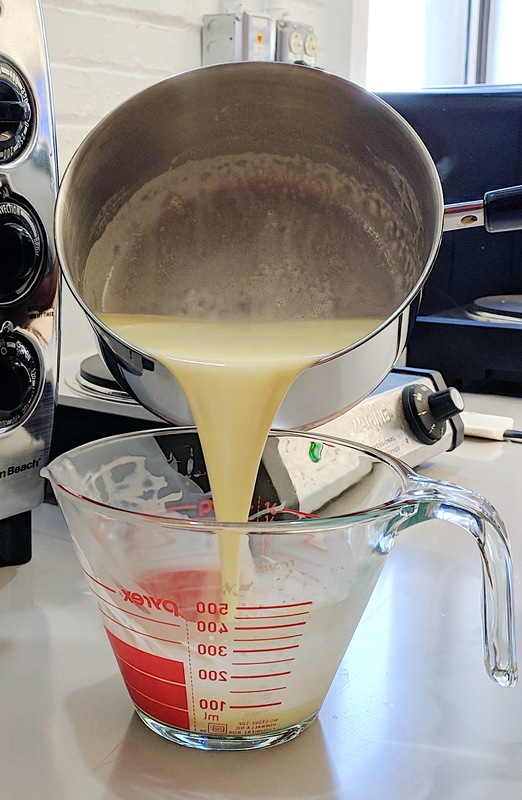 5. put your cream and butter mixture in the microwave for a few seconds if it is not hot and then slowly pour this mixture into the sugar syrup while whisking the syrup thoroughly and quickly. Once all the butter cream mixture has been mixed in stop mixing. 6. Next whisk the salt into the caramel. 7. Then pour the caramel into a glass measuring cup so it can cool. 8. Finally let the caramel cool to room temperature. 1. Preheat the oven to 350ºF and line a baking sheet with parchment paper. 2. Spread the hand full of hazelnuts on the sheet and place them in the center of the oven. Let them roast for 12 minutes or until they are lightly browned. 3. Put a toothpick in each hazelnut. 4. 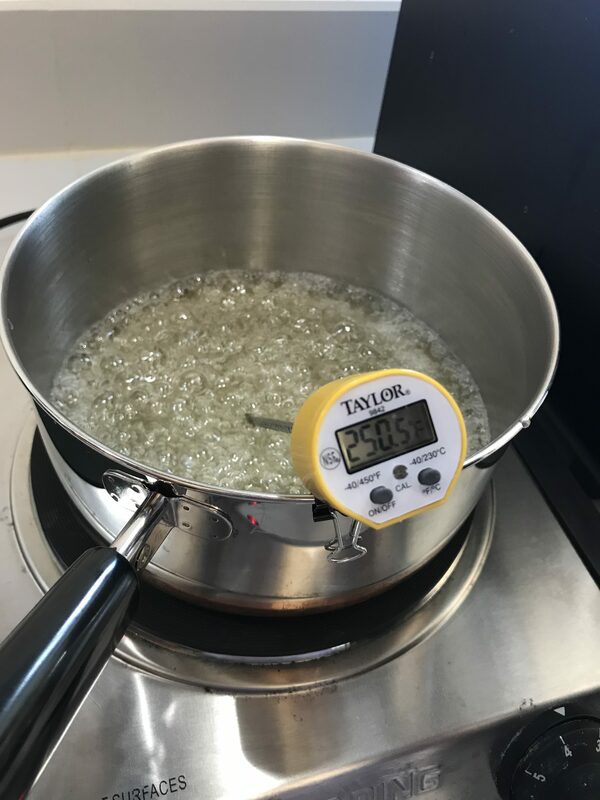 Then melt the sugar and water in the saucepan like before on medium heat and after 320°F take the syrup off the heat once it has reached the desired color. Let this cool for only about a minute. 6. 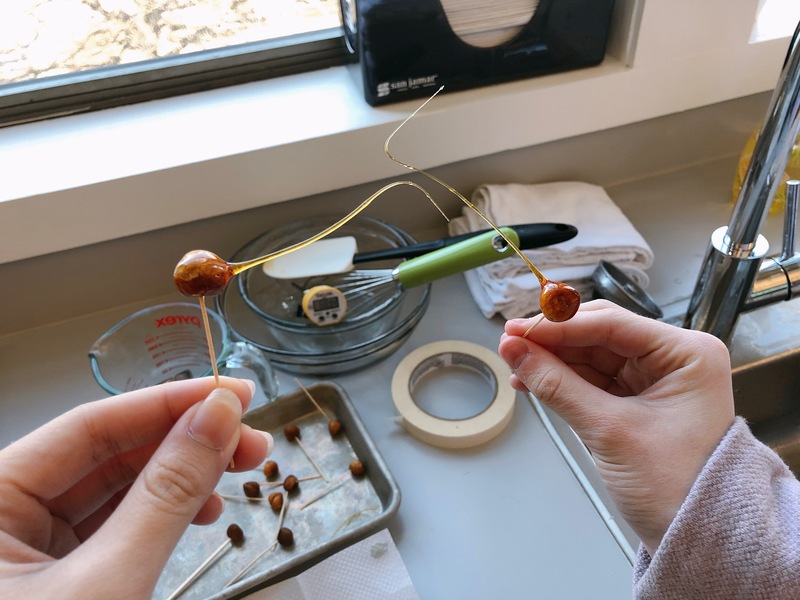 Next dip each hazelnut in the caramel by holding the toothpick. 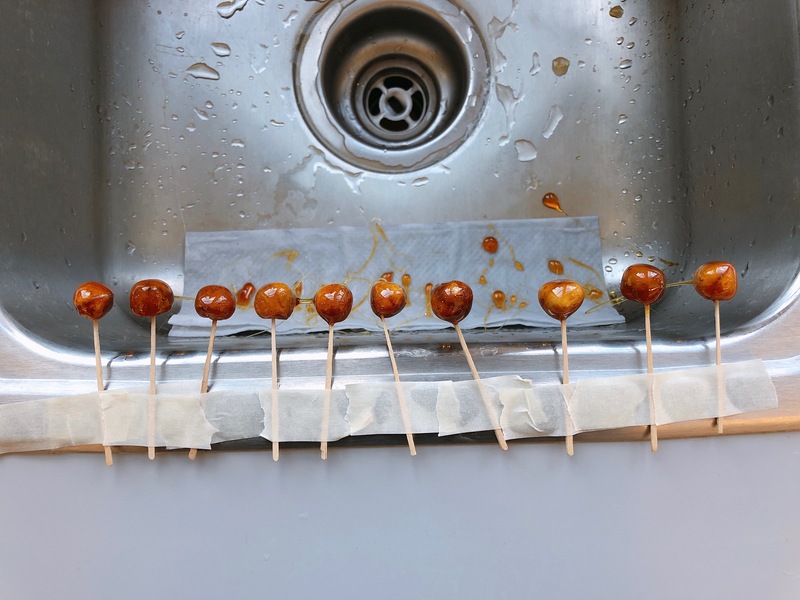 Place the hazelnut over a sink so the caramel drips down creating icicles and keep them in place taping down the toothpicks. 7. Let the hazelnuts cool completely. 1. Fill a bowl only half way with very warm water. 2. 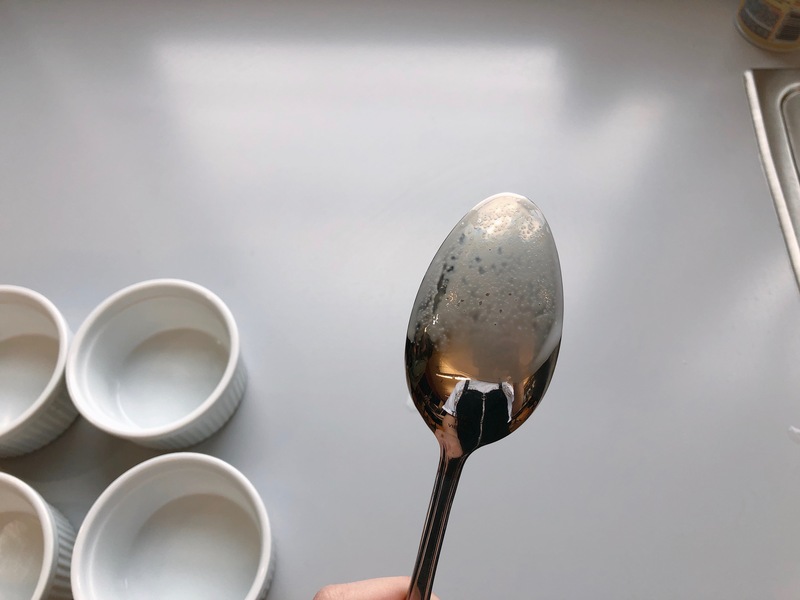 Run a thin knife around the top edges of the ramekin. 3. Dip the ramekin in the warm water up to its rim, and hold it for about 3 seconds. 4. Invert the ramekin onto a plate and gently shake so the panna cotta falls out. Here is the video reflecting on the Panna Cotta Van and I made in class! Why is the darker caramel, less sweet? The caramel when it is darker becomes more bitter and has this different color to it because of the increased oxidation of the sucrose that is boiling which results in the caramel molecules giving off the darker brown color and also making the caramel more bitter. At what temperature did YOU see caramelization chemistry occuring? How did you know? We saw caramelization happening when Van and I saw a change in the color of the sugar mixture. Before it was even at 320 degrees the second time we made the caramel for the hazelnuts we saw it caramelize before then because the mixture was turning a golden brown and bubbling up more than it was before. I love your blog! The instructions are so clear and easy to follow, and the pictures are probably the best I’ve seen on anyone’s blog – I feel like I am standing right there watching. I like how the answers were short and to the point as well. Amazing job! Really really nice work guys! The post itself flows very nicely and looks professional. It also sounds like your panna cotta came out well. 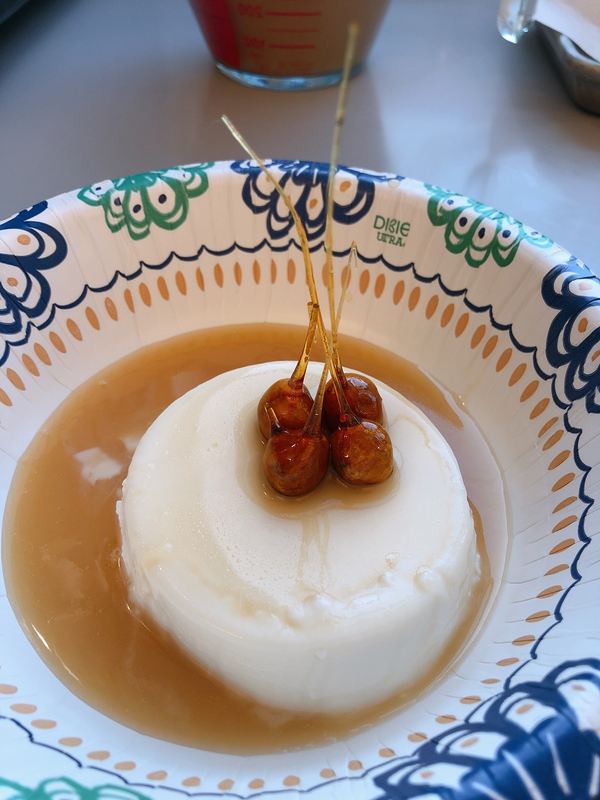 The second batch of caramel you made for the hazelnuts had a very nice color, and it made wonderful icicles when you coated the hazelnuts. Nice goin’! I cannot believe that in all my time writing these blog posts, I never once thought to put the picture of the final product at the top of the post. It immediately catches the eye and makes the reader want to see where it leads. Anyway, the rest of your post is well-organized, descriptive, and has good looking pictures. 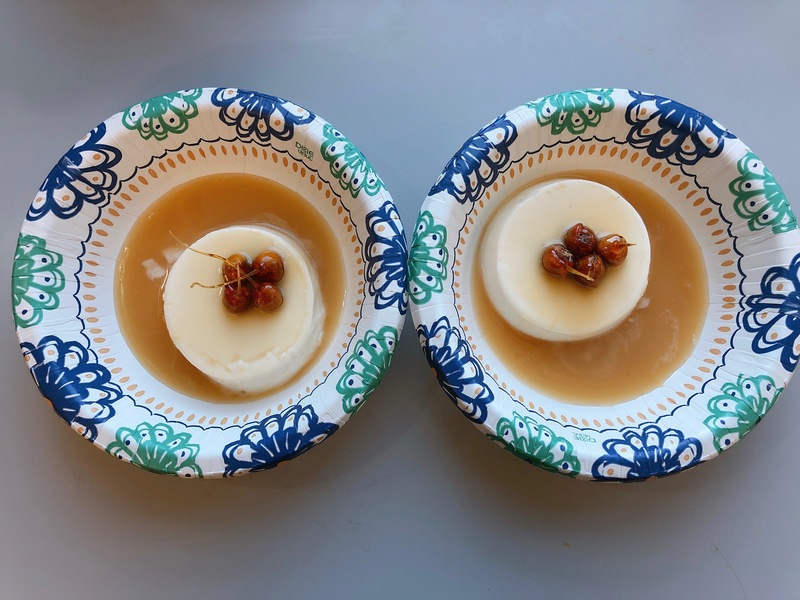 The panna cotta look great, and the questions are answered well. Nice job!